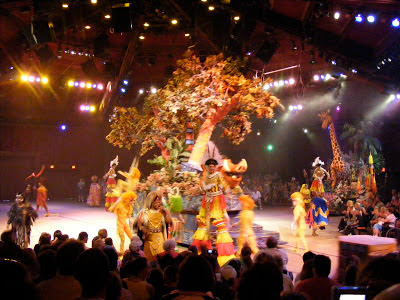 Finally we have some news on the potential relocation of the Festival of the Lion King. John Frost of the terrific Disney Blog is reporting this morning on paperwork filed by Disney leading us to the show’s future location. In paperwork filed with the Florida water district management agency, we now know that the FotLK theater will be moved to a new plot of land in Africa. It will be to your left as you cross over the bridge, behind the Tusker House restaurant. Imagineers have been spotted in the area taking a few measurements. So its possible work on fencing in and clearing the plot could begin any day now. So we have the “where” but still no news on the when. A few months back, rumors suggested the attraction would be closing in early 2013, as early as January. The new Avatar project is slated for the area now called Camp Minnie-Mickey, so FotLK has to be relocated or closed before construction can begin. But nothing has been confirmed, so we can only assume this is not happening until Spring at the earliest. This is good news for the DAK fanatic, as many who were not exactly thrilled about the addition of Avatar to the park were dreading a possible permanent closure of the FotLK. But now we get the best of both worlds. We get a huge and expensive park expansion while also seeing FotLK moved to where it should have been located in the first place.